Annie Macaulay–Idibia (born November 13, 1984) is a Nigerian, model, presenter and actress. She was nominated in the "Best Supporting Actress" category at the 2009 Best of Nollywood Awards.Annie was born in Ibadan but she is a descent of Eket in Akwa Ibom State. She moved into Lagos with her mother after the divorce of her parents. She holds a degree in Computer Science and Theatre Arts after completing undergraduate courses at Lagos State University and the University of Lagos respectively. 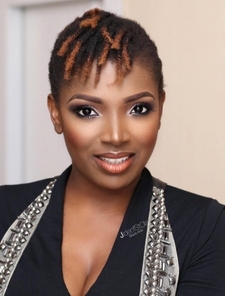 Prior to the start of Annie Macaulay–Idibia's acting career, she competed at the "Queen of All Nations Beauty Pageant" where she placed runner-up and she also went on feature in a cameo appearance on the music video of 2face Idibia's "African Queen" song.